Thank you to Oriental Trading Company for providing some of the supplies for our Beach Fairy Garden project. All opinions expressed are my own. I'm not sure if I know anyone who loves the beach as much as my mother-in-law. She goes to Florida for the winter and comes back to her home near the beach for the remainder of the year. 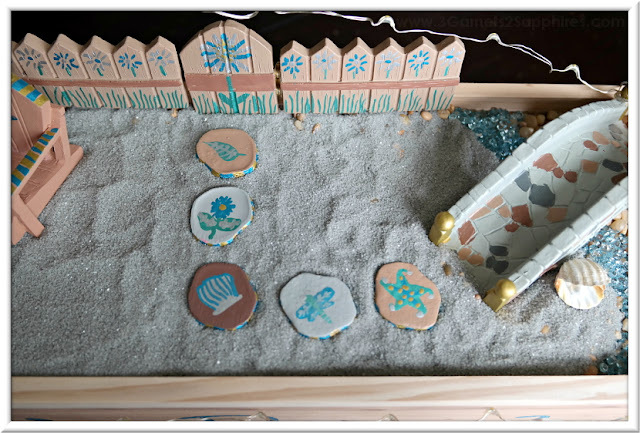 That's why my daughter and I thought it would be a fun project to create a beach fairy garden for my mother-in-law to enjoy year-round. I decided to create it in a window box, so it can sit on a windowsill for all to see without taking up too much valuable space. Want to make your own Personalized Window Box Beach Fairy Garden? 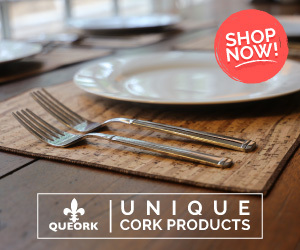 Here are some of the supplies you might need, although it will vary depending on your own personal preferences. For example, our beach is rocky just like the ones around here, but you might want to create a beach without any rocks at all. It's all up to you! 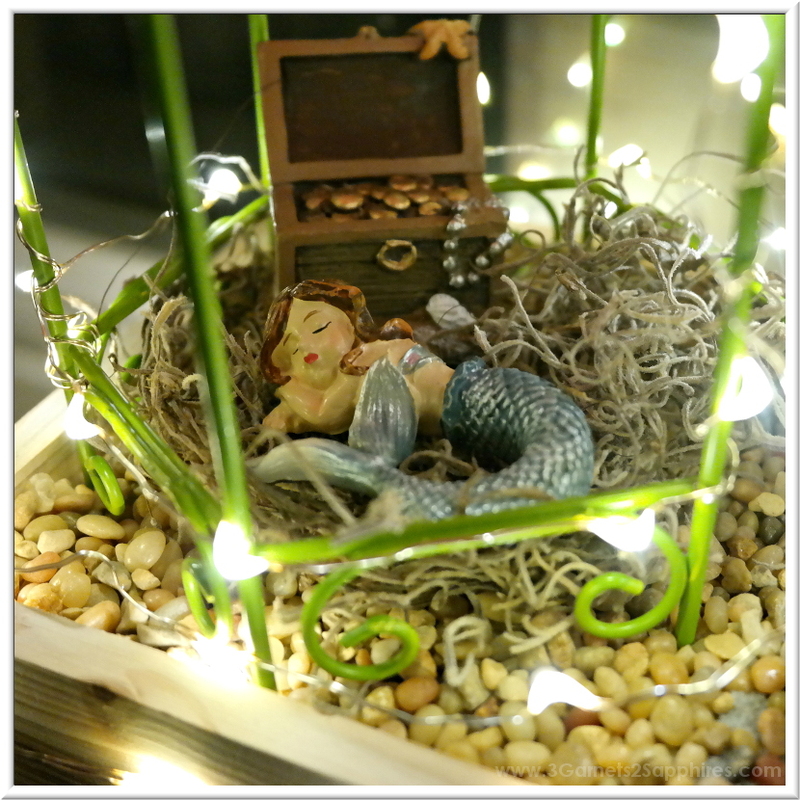 I found much inspiration looking through the fairy garden supplies on Oriental Trading Company. 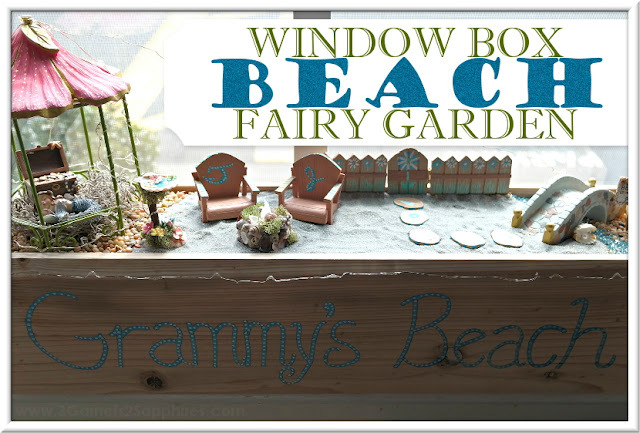 How to Personalize the Window Box . . .
2. Choose an acrylic paint marker for your lettering. I chose a set of DecoColor™ Metallic Acrylic Paint Markers because the colors were very beachy. The blue turned out to be the perfect color for the lettering. 3. 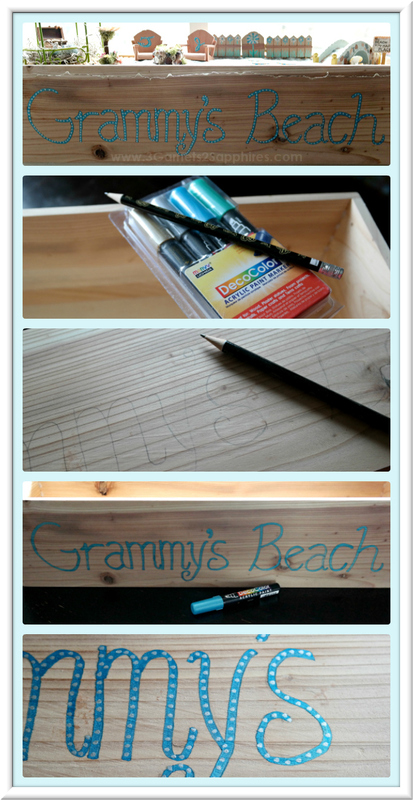 If you would like to add a little something to your lettering, here is a super-easy way. Wait for the lettering to dry completely. Then go back and add dots of a contrasting color paint to your lettering. I chose to use silver. 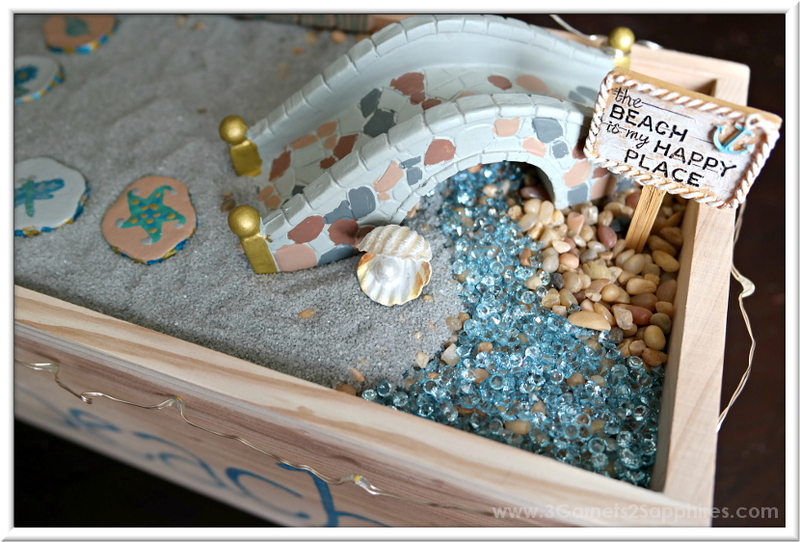 How to Create the Beach Fairy Garden Foundation . . .
2. 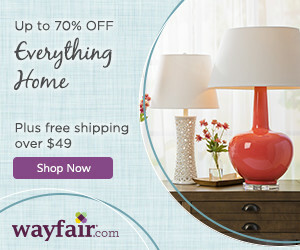 To add sturdiness, stuff the square tube you've created with old newspaper, old homework, or other scrap paper. 3. Insert cardboard into the flower box. The top edge of the flower box should be about 1-1/2" to 2" taller than the cardboard insert. 4. Cover the entire cardboard surface with a thin, but even layer of river rock, making sure that no cardboard shows through. You can find river rock in the aquarium section at your local pet store. 5. Add a layer of grey/silver sand where you would like sand, and aquamarine crystals where you would like a representation of water. 6. Add a little more river rock to even out the landscape around the areas of sand and crystals. 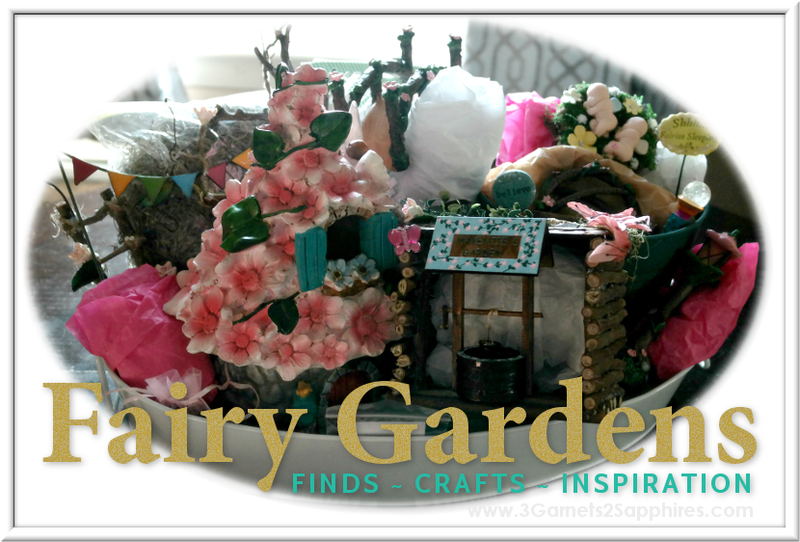 Customize Fairy Garden Decor with Acrylic Paint Pens . . . Using the same DecoColor™ Metallic Acrylic Paint Markers that we used to personalize the flower box, we were able to put our own personal touches on the fairy garden accessories pictured below. Here's what we chose to do, but the possibilities are really endless. 1. I used the gold paint pen to outline the edges of the petals on the roof of the gazebo. I also accented the veins in the leaves and the stem at the top. Then I added dotted gold lines down the length of the petals. Finally, I used the silver paint pen to add specks along the bottom curved edge of each flower petal. 2. My 13 year old son used the gold paint pen to paint the four posts on the bridge gold. 3. My son also added the monograms in cursive to the backs of the Adirondak-style beach chairs. He also added blue and gold stripes to the arms of the chairs and the top edge of the chair backs. Then I added dots on top of the monograms to match the lettering on the front of the flower box. 4. On the stepping stones, my children painted a dragonfly, a seashell, a leaf, a flower, and a starfish. Then I added stripes around the edges of the stepping stones to match the arms of the beach chairs. 5. On the fence, I added some blue, white, and green flowers plus some blades of grass at the bottom. 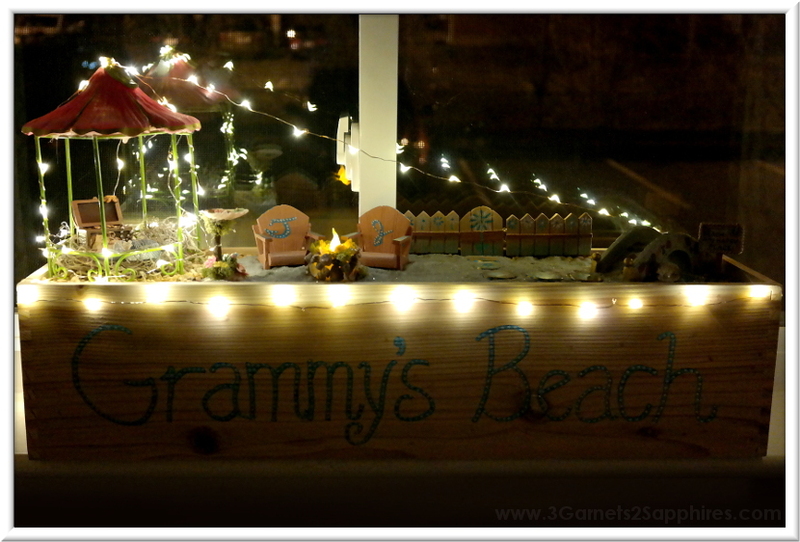 Adding Lights to Your Beach Fairy Garden . . . If you've never used mini LED string lights, they are very easy to work with because the lights are on a thin wire. There is a box that holds batteries and the on/off switch on one end of the light string. 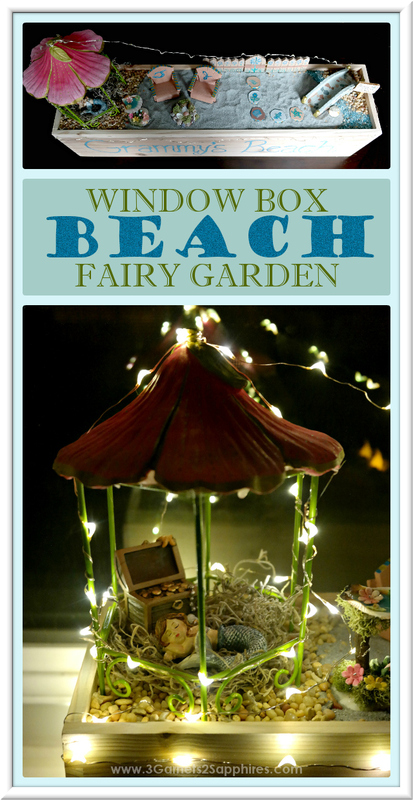 Place that box behind the window box, so that it is accessible, but out of sight. The gazebo is a natural starting point for your lights. We strung ours up and down the posts all around the gazebo. Then we ran the lights up to the roof of the gazebo and secured it around the stem. From the top of the gazebo, we ran the lights all the way to the other end of the beach fairy garden and secured it around the bridge post. From there, we ran the wire around the right side, the front, and the left side of the flower box, back to the birdbath and the gazebo. At night, the lights look just as lovely from the outside, as they do from the inside. 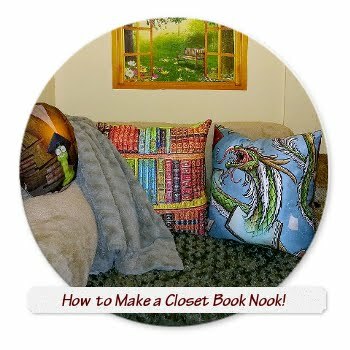 They also add a touch of whimsy and magic to the display. Fairy & Gnome Garden Set - I found this fairy garden accessory set at Oriental Trading. These pieces really were the perfect blank canvases, and would easily work in a regular fairy garden as they did in our beach fairy garden. 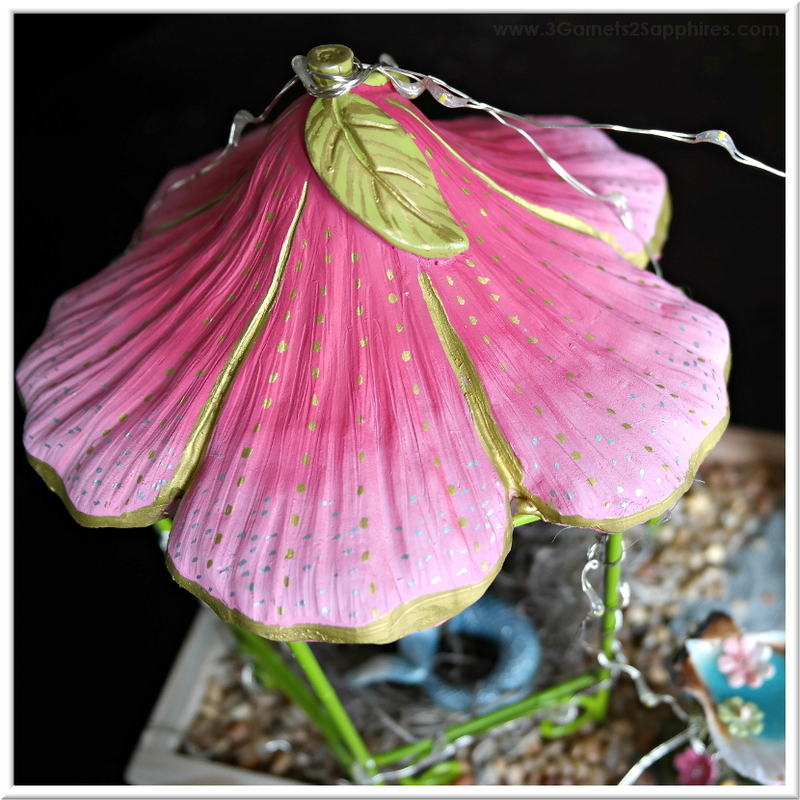 Light-up Seashell Fire Pit - I bought this item from one of my favorite crafters, adorablyimperfect, who also made the pretty shell birdbath. 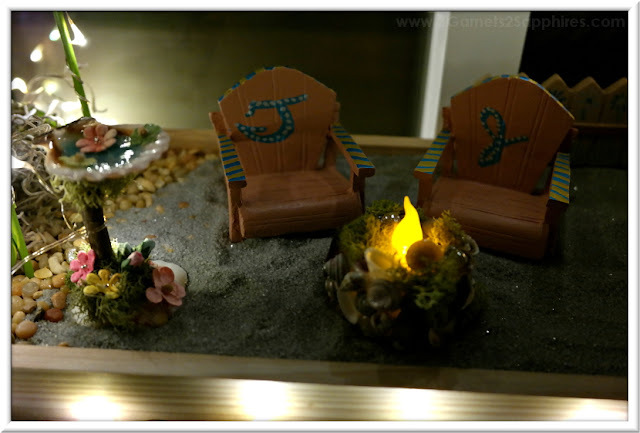 I feel like a working fire pit is a must-have if you are using lights in your fairy garden. 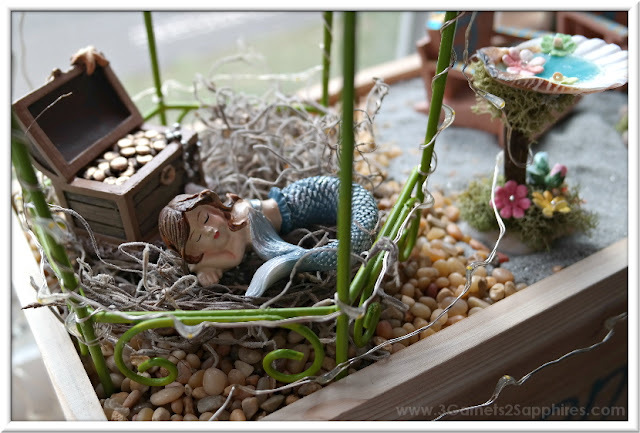 Like these fairy garden ideas? PIN THIS post for later . 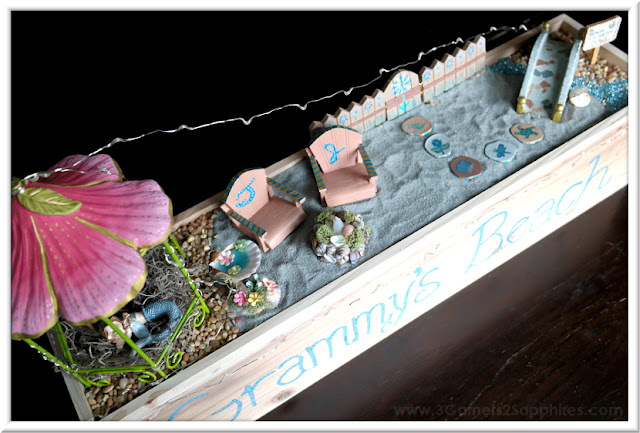 . .
How would you personalize your own beach fairy garden? 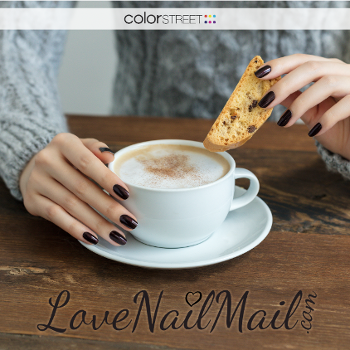 Share your ideas with us in a comment here.